Stephen Barnabis is a life-long Londoner who has worked with young people in his community for over 28 years, delivering programmes that promote social inclusion and prevent anti-social, offending behaviour. 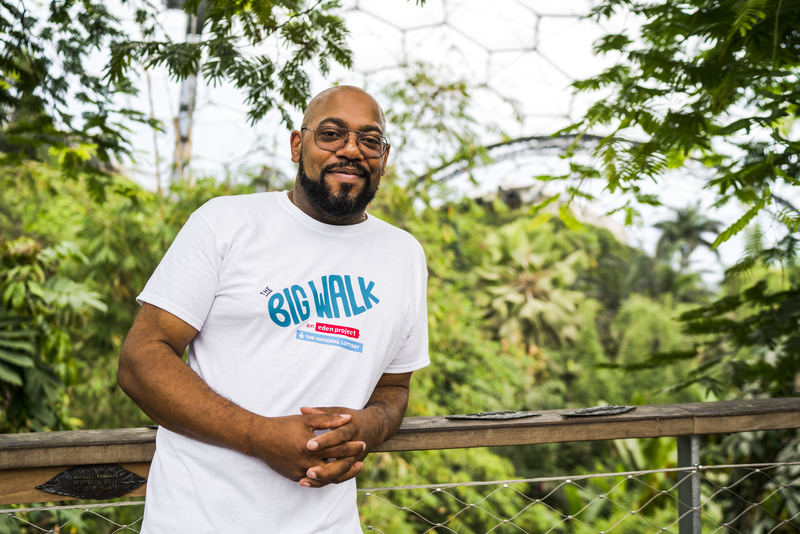 With government cuts and funding running tight, Steve was inspired to take part in last year's walk to learn how other projects achieve their aims in similar circumstances. He also wanted to take on a challenge to see just what he could push his body to do. So, he laced up his walking boots and joined Team England, walking nearly 300 miles across the country, connecting communities, sharing stories, and spreading The Big Lunch spirit. What was a typical day like for you on the walk? We started with an early morning briefing where we would be given some basic information about the community projects we were due to visit that day. We agreed that we didn't want too much information about the project as we didn't want to build up any preconceived ideas about what we were going to find. It helped us to be open-minded and encouraged us to ask more questions about how the project was really benefiting the community. We’d spend a few hours there finding out about the work that they do and meeting beneficiaries of the project, then have some lunch, which normally involved a lot of cake! The days could be quite long and for somebody that was really a non-walker before I started, it could be quite taxing. My body certainly would feel it, and getting through the day was physically as well as mentally challenging. But saying that, the sense of achievement when we got to our final destination was great. Learning about the great work being facilitated at the stops certainly made it worthwhile. There were many, but meeting a young man with learning disabilities at a community gardening project is a moment that stands out for me. He greeted us with such joy and a huge hug. He was so happy that we had come to see his garden and he showed us around with great pride. You could see how much he was benefiting from the programme and the wonderful relationship that he had with the volunteers and project leaders. Through our time spent there we discovered there weren't any other services that he could really access, as it was quite a small village. It demonstrated what could be achieved with a positive vibe and the warmth of the community. How did it help your own work? I was inspired by the people that I met: individuals that selflessly gave their time and energy to deliver projects for the benefit of their community. It really gave me a boost and a renewed energy. If you could give a piece of advice to future walkers, what would it be? Take part with an open heart and an enthusiastic spirit. You will be part of a fantastic team and get to meet some inspirational people. They put so much effort into their community project and will be so happy to share what they do with you. You have an important job to help them to tell their story, so just be open and embrace the experience. It’s an unbelievable and unique challenge, which demonstrates the strength that individuals can bring to community cohesion. Are you up for the challenge for 2019? Join in: apply to be a walker.